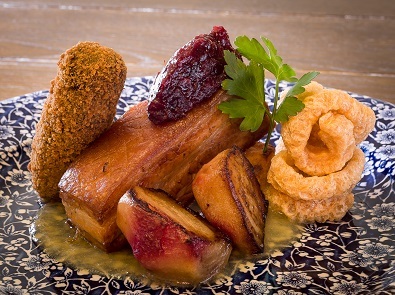 As a family friendly pub, we’re very food orientated and serve only the best quality traditional pub meals. We use freshly prepared ingredients and are proud to serve a selection of legendary pies that we source from our local butcher, Higginsons of Grange. Our recently refurbished interior is contemporary and yet retains that traditional British pub feel, giving it a great balance of comfort and modernity. No matter if you want to enjoy a pint of ale by the real fire or sit down with your children for a delicious pub meal, you’re guaranteed to feel comfortable throughout your visit. We’re lucky enough to be positioned close to a popular walking route making us a great place to fuel up before a hike and to rest after a hard days trek. After all, nothing beats a Great British pub after a long walk in the Lake District. We also welcome dogs into our bar area and have dedicated taps and bowls outside where they can enjoy a refreshing drink. So whether you’re stopping in for a pint or enjoying a three-course meal with your family, The Flying Pig in Bowness-on-Windermere is your number one choice for a true British pub experience. For decades British food has been the culinary joke of many nations. 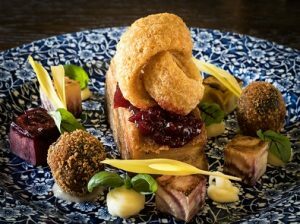 It’s been labelled as bland and unappetising and you might have even heard the phrase, “The day you get a good British meal is the day pigs will fly”. However, those days are long gone. Traditional British food is not only a joy to eat but it will have you coming back for more. That is our aim…welcome to the Flying Pig! © Copyright 2017 - High Spirits Leisure Group Ltd.